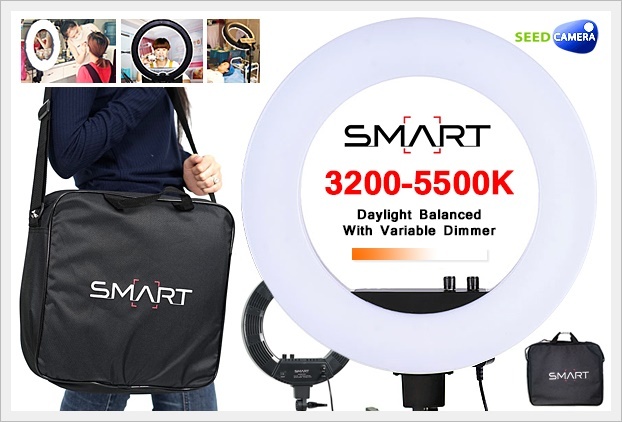 Ring-shaped designed, with eye protection LED lamp beads, low consumption, high brightness and 3200K-5500K adjustable color temperature, this LED ring light will give you excellent shooting experience. You can use it as a fill-in light for pictorial shooting, network broadcast, wedding shooting, still lift shooting, etc. - High-quality LED video light, 50W low consumption and high brightness. - Adjustable brightness and color temperature(3200K-5500K), meet your different shooting needs. - Upgrade warm light & cold light effects, providing you with more natural light and more vivid photos. - Ring-shaped designed, can create charming catchlights during portrait photography. - Including a phone clip and a cold shoe base for mounting smartphone and speedlite. - Comes with a mirror for make-up, very convenient and practical. - Comes with a carrying bag for convenient storage and carry. - Ideal for indoor pictorial shooting, network broadcast, wedding shooting, still lift shooting, etc.